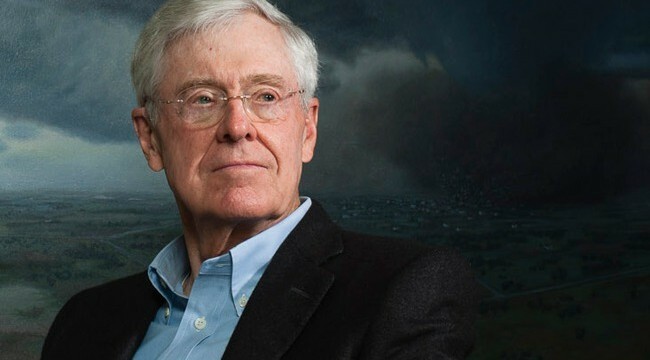 NORMANDY, France – Again, we were overwhelmed by the volume of reader feedback – almost all of it centered on Charles Koch (whom we wrote about earlier this week here andhere). We will drop the subject – promise! – but only after one small observation. At the core of that sentiment is the idea that a voter (in Congress or at the polling station) may not pull the lever for the proposition that would be best for the nation, but the one that would be best for him personally. The voter has been, in effect, bribed. We believe this is the way democracy works. It will only work properly when people with a personal interest in an issue – salary, pension, reputation, tax break, subsidy, business advantage – recuse themselves. That’s the way it works on corporate boards and church vestries all over the country: If you have a conflict of interest, you excuse yourself and remain silent. An election is “an advance auction of stolen goods,” wrote Ambrose Bierce. But Charles Koch’s money is not stolen. He earned it. Besides, it is a pittance compared to the other amounts involved. The entire federal budget (and hundreds of billions more in tax and regulatory favors) is up for grabs in every election. And for every cent a lawmaker might get from Charles Koch’s money, he might expect to get hundreds of dollars more from the medical industry, the education complex, the military establishment… or directly from the feds. And for every lobbyist Charles is able to put to work for his “less is more” campaign to reform the federal government, there are hundreds of people lobbying for “more is more” – including many who are already on the government payroll. There are thousands and thousands of organized groups pushing for more government money, higher medical benefits, new computer systems to spy on us, new warplanes, new wars, new this, new that – trillions of dollars all told – all of it to be bought with other people’s money. Can you really blame Charles for trying to push back? Democracy is often described as a system in which three wolves and one sheep vote on what to have for dinner. In the meantime, investors didn’t seem to know what to make of things yesterday. The Dow rallied and sold off again – ending the day slightly lower. The signals that came out yesterday were mixed and left investors confused. The press was confused too. Reporters gave out good news and bad news without any clear idea which was which. Everyone is waiting for clarification. A sign in the heavens. A booming voice. A crash in the stock market. A kick in the pants. Lend money below zero interest rate? It is true, as an economist friend, Pierre Lemieux, pointed out to us, that “short-term interest rates don’t determine capital values.” But it is also true that lending below zero is nuts. This situation can’t go on, we tell ourselves. And yet it does, somehow. So, we crane our necks and stare at the sky, as if we were waiting for an extraterrestrial invasion. When? How? What will come? 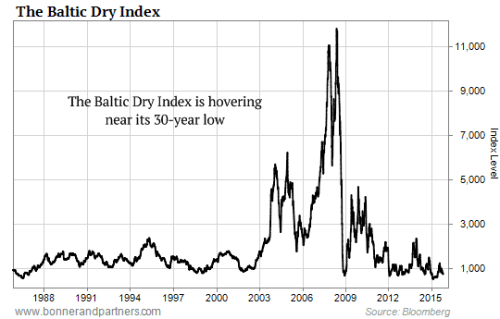 The Baltic Dry Index – a measure of the price of transporting raw materials by sea – is hovering near its 30-year low. Of course, sliding charter rates are a result of supply as well as demand. But it suggests a major, worldwide slowdown in global trade. And over on the other side of the world, this view is confirmed by the Chinese Containerized Freight Index. This tracks the cost of shipping containers from China to 14 destinations. And it is down 30% since 2013. Hitachi Construction Machinery Co., Asia’s second-biggest maker of building equipment, cut its sales and profit targets for the year as a slowdown in demand in China extends to the developed world. Its shares fell the most in a month. The company trails only Komatsu Ltd. in Japan’s construction equipment market and is among the world’s top suppliers of the large excavators and dump trucks used by miners. Cummins Inc. fell the most in more than three years after third-quarter profit trailed analysts’ estimates and the company reduced its annual sales forecast because of weakening demand for its heavy-duty engines. The company also said it’s cutting 2,000 jobs as part of a plan to save as much as $200 million a year. Back in China, demand for steel (you can’t build anything without it) is “collapsing,” according to Bloomberg. New orders are falling faster than production cuts. You can get any opinion you want on China. But after 65 monetary interventions from the People’s Bank of China in 2015 alone, the economy is clearly slowing. That means less seaborne traffic… less demand for primary commodities… less output… and less cash and credit flowing around the planet. This last point is perhaps the most important. It has been the rush of credit that was largely responsible for the booms and bubbles of the last 20 years. Now, individuals are reluctant to borrow. Only corporations and governments are net borrowers. And credit is so cheap that lenders have to pay governments to take their money. Five-year government bond yields are negative in eight European countries. The whole system creaks and groans… and slows down.